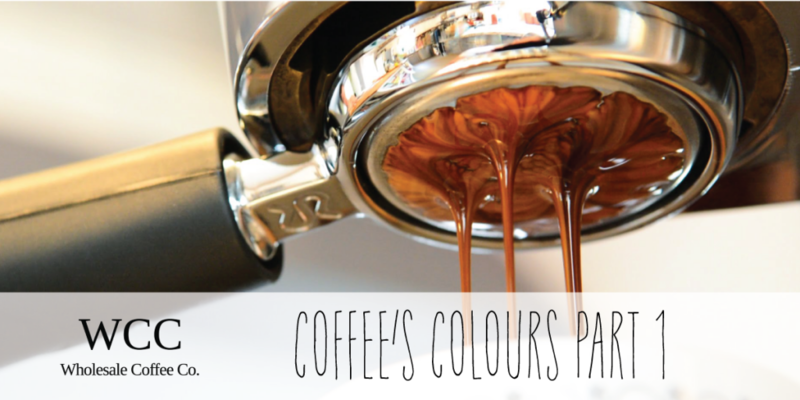 Coffees Colours Uncovered Pt. 1 | Wholesale Coffee Co.
For this tip we are going to get started on the secrets of coffee’s different colours and what it all means. Firstly coffee is made up of a huge variety of different chemicals but for the next few tips we are going to simplify into a form that you can easily see, taste and smell for yourself. Once you’ve pressed the button on the coffee machine there’s always a few seconds before coffee starts coming out. This is called the Drop Time. Drop time is important because this is when the machine is building up water pressure in the portafilter to extract the first and one of the most important elements of coffee flavour, The oils. Oils are important, you only get a very small amount from a coffee shot (about 10mL of the 60mL) but the flavour that you get from it is most of what you taste in a milky coffee. They’re easy to spot too as they’re mostly extracted at the start of the shot and are a very rich dark brown. Oils will only extract if there is enough pressure in the system so if your grind is too coarse you’ll notice that you’re getting little to no oils in your coffee shot which leads to weak milky coffees. To understand just how potent oils are try overpacking a coffee shot and catching only the dark brown oils at the beginning of the shot, it’s shiny and very very intense. Once you’ve tried a little it’s easy to see how just 10mL can make such a big difference in a coffee.